The feisty and plentiful Atlantic croaker may well be the ultimate family fish. Any fisherman who catches a half-dozen quality fish in less than 30 minutes is bound to be one happy angler. Six-year-old Peyton Eaves is no exception. Big brother Patrick, age 14, is currently two fish behind — a carefully documented fact that his younger sibling has brought to his attention at least twice in the past five minutes. The boys’ father turns to me, grabs another small piece of fresh dead shrimp from the boat console and threads it onto a waiting hook. I can, and they do. It’s an affirmation based on experience. I’ve been a vocal fan of the diminutive but spunky Atlantic croaker ever since I was old enough to push the button on a discount- store spincasting reel and watch a quarter-ounce egg sinker fall into the water and disappear, trailing behind it a small single hook loaded to the hilt with a peeled shrimp tail. Still, my own fondness aside, Micropogonias undulatus could use a good publicist. After all, to most Texas saltwater anglers, “croaker fishing” means live bait fishing for speckled trout, with the croaker as the bait. To the affable Eaves brothers and thousands of other enthusiastic fans like them, however, “croaker fishing” is just that, fishing for croaker. There are reasons aplenty to love both the sport and the species. Unlike speckled trout, redfish and flounder, the croaker is not a “glory” species. As unassuming as an edible and catchable coastal fish can get, the bottom-feeding panfish seldom bite artificial lures and rarely grow much larger than a school trout. “Big” croaker weigh only a pound or so. Two-pounders are considered exceptional. The Texas state record, a 5.47-pound mini-bull landed on April 24, 2002, by fisherman Paul Straw is nothing shy of a freak. Think 20-pound largemouth bass and you get the picture. Nonetheless, what the croaker lacks in proportion it more than makes up for in plentitude. Downsized members of the drum family that emit a distinctive, sharp grunt when caught (thus the name), croaker are the coastal fishery’s equivalent of the field mouse. Game fish, particularly speckled trout, readily eat them. And throughout the Texas coast, action-focused fishermen thoroughly enjoy catching them. Ounce-for-ounce, the Atlantic croaker is perhaps the hardest-fighting panfish in Texas saltwater. Promptly filleted and fried, it’s also one of the tastiest. That, perhaps as much as any other reason, is why youngsters like the Eaves brothers get so pumped about croaker fishing. “I walk into his bedroom to wake up Peyton and he’s already dressed,” Phil Eaves tells me. “I’m not sure he even sleeps.” Patrick, he says, might need five minutes to gather his wits. Then he’s up, too, packing his gear. Maybe it’s the hunter-gatherer instinct in its earliest stages. Then again, maybe it’s simply a kid’s basic need to show off a bit whenever he’s given the chance. Either way, Eaves says the fact that his boys can keep much of their catch carries far more weight than the freezer bag full of hand-sized fillets that are more often than not the result of a typical trip. I do remember. Listening to Eaves talk about his sons, I suddenly realize that it wasn’t a hundred yards from here where I caught my first fish, in 1961. The Clear Lake Channel is a far different place than it was four decades ago. The old, weather-beaten buildings on the channel’s south side were long ago razed to create ample room for a sprawling and brightly lit complex of high-end restaurants and fountains, a world-class hotel and even a full-blown amusement park with a Ferris wheel. The south-side scenery is radically different today, its flaky-paint ambience only a memory. Fortunately, the resident croaker never noticed the transformation. Fishermen still catch their share of keeper-sized croaker from the Clear Lake area year after year. This is, however, only one small spot of many where the feisty little fish can be found and caught with surprisingly little effort and expense. According to Page Campbell, a Texas Parks and Wildlife Department biologist based at TPWD’s Rockport Marine Lab, most of the state’s recreational croaker landings come out of the Galveston Bay system and the Sabine Lake area near the Louisiana border. Campbell should know. She has lived in South Texas for 28 years, and spent many a lazy day as a child catching large numbers of eating-sized croaker from the fish-attracting rocks of the Port Aransas jetties. There isn’t a jetty system in the state that will not, from March through early November, produce quality catches of the increasingly popular panfish — ditto for the beachfront piers and easily accessible surf waters from Beaumont to Brownsville. Croakers are where you find them. Throughout Texas inshore waters, that’s virtually everywhere. The species experienced its heyday in the 1960s and ’70s, when the annual fall “golden croaker run” drew serious coverage in the sports sections of area newspapers. On the far upper coast, Rollover Pass near Gilchrist was, and still is, perhaps the state’s most frequented and celebrated spot for autumn-run croaker fishing. Bank fishermen, especially the disabled and elderly, converged in elbow-to-elbow legions around the narrow and historic pass between East Galveston Bay and the open Gulf of Mexico. Given its bay-to-Gulf proximity, Rollover Pass represented, and still represents, primo croaker fishing waters. One- to two-pound fish colloquially called “golden croaker,” their scales tinted deep bronze through maturity, drew fishermen from throughout the state as the migration peaked in mid-October and early November. Though the action at Rollover Pass, San Luis Pass and other once-legendary fall croaker locales has enjoyed a bit of a resurgence in the past several years, the fishing today is only an echo of its past glory. For reasons still being researched, Atlantic croaker populations gradually declined until leveling off in the mid-1990s. One possible factor contributing to that stabilization are the fish excluder devices now affixed to shrimp trawls, which can substantially reduce unintended bycatch in shrimpers’ nets. Furthermore, select estuaries have been closed to trawling, and perhaps most significant of all, an ever-increasing number of commercial shrimp boat licenses are being retired as the result of an aggressive “buyback” program that is, with time, decreasing shrimp trawl pressure on the state’s bays and estuaries. Texas Parks and Wildlife Department Coastal Fisheries Biologist Leslie Williams works out of the department’s Dickinson Marine Lab near Galveston Bay. “We’re looking to see if the shrimp license buyback program might show some positive effects on the croaker fishery,” Williams tells me. That Texas croaker are at the very least holding their own speaks loudly for the species’ resilience, its stubborn propensity to spawn and survive, even in a hostile environment that treats them like fast food waiting to happen. As live bait, both the harvest and value of the fish have significantly increased in the past decade. According to Campbell, most of the fish do not spawn until the end of their second year. 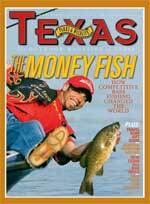 It’s also considered a bragging-size specimen by croaker fishing enthusiasts. Our trip this morning will yield no such whoppers, but Dad is still proud of his boys. They box enough fish in the one-pound class to keep Vinton busy with an electric fillet knife for about 20 minutes. Vinton has known this for years and has steadily built a name as a family-oriented fishing pro. He isn’t so insecure and ego-driven as to let a fish’s lack of prestige keep him from using it to help change the lives of both impressionable youngsters and the caring adults who take them fishing. Viewed from that perspective, the underappreciated, but always cooperative, Atlantic croaker of the Texas coast might well be the most glorious species of all. The Atlantic croaker’s status as a first-rate “family fish” is only bolstered by the fact that suitable croaker-fishing tackle won’t bust the family budget. For youngsters, angling novices and anyone who appreciates affordable, durable and easy-to-use gear, a moderately priced spincasting rig is the ultimate choice. Also called “pushbutton” reels, spincasting reels are virtually backlash-proof. Most are designed with easy-to-use star drags that greatly simplify line tension adjustments. Some even sport stainless steel ball bearings. They come pre-filled with monofilament, though at the standard 8- to 10-pound test it’s generally too light for yeoman’s duty in saltwater. A 150-yard filler spool of 12- or 14-pound-test mono provides plenty of line (and leader) for at least two spincasters, and is well worth the investment. Spincasting reels range in price from as little as 10 bucks to upwards of $50, depending upon the quality of construction and components. Regularly cleaned and oiled, a mid-range spincaster should last several years. Most spincasters are purchased as part of rod-and-reel “combo” rigs that usually include inexpensive but durable fiberglass rods with pistol-grip handles that suffice for most purposes. Rods of this type are almost invariably light and whippy, and under pressure, will thrill young croaker catchers with dramatic rod bends. Unless tidal currents mandate more weight than the quarter-ounce egg sinker typically used on terminal tackle for croaker fishing, a combo-pack rod will get the job done. Anglers who buy rods and reels separately often do so in order to get a slightly stouter rod, usually a 5-1/2- to 6-foot graphite composite with a much faster tip than fiberglass affords. An extra 20 to 30 bucks will usually cover the bill for a rod that will handle both heavier sinkers and heavier fish. Terminal rigging is simple, most often the popular “Carolina” (a.k.a. “fishfinder”) rig. To tie the Carolina rig, thread the main line through an egg sinker and then tie on a small barrel swivel. Tie a foot or so of extra monofilament below the swivel. At the end, affix a small, single-barbed hook with an offset shank and eye to improve hookset efficiency. Croaker rarely take hooks deep, but hook-outs or needle-nosed pliers are nonetheless invaluable to the adults who are charged with unhooking fish. Fresh, peeled dead shrimp is the all-around best croaker bait. The fish are notorious nibblers, so be prepared to rebait hooks frequently. Squid is much tougher than shrimp, and will stay on a hook much longer. Usually, though, the scrappy little bottom-feeders prefer shrimp. Then again, a piece of cut squid fooled the current Texas state record Atlantic croaker.